This Methi Biryani yields a spicy, flavorful, nutrient-rich Biryani. Very easier to make and explained in step by step pictures and detailed instructions. Have ever wondered what to do with Methi leaves other than making Kootu or Dal? 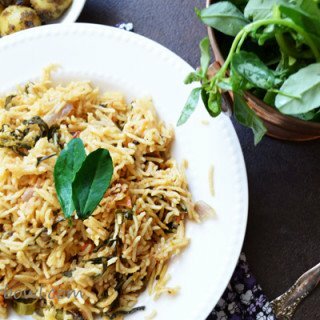 This Methi Biryani is one such inspiring recipe, where you can use them alternatively. After trying this, I’m sure you buy more to make this Biryani regularly. It is the spring time here, and our grocery stores are loaded with plenty of greens at cheaper rates. Obviously, my hands dropped few more bunches into the basket. In the same week back to back, I cannot make methi kootu, methi poriayl for my fussy eaters. I have a formula like more ingredient at a home=new recipe from the kitchen. These are the simple factors behind today’s Methi Biryani. Needless to say here, that it was appreciated by everyone like one I have with Soya Chunk Biryani. And asked me to fetch more green bunches from the store next time. 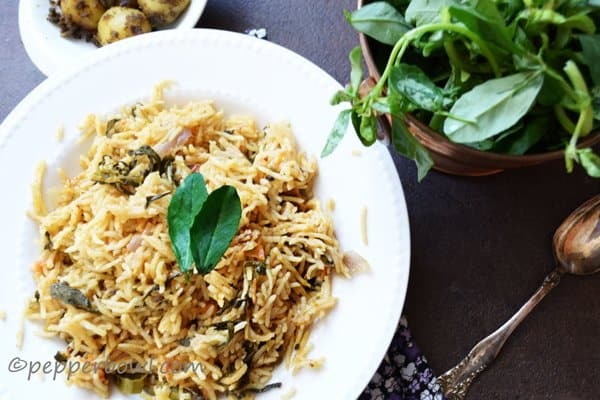 All the secret of this Methi Biryani is to get basmati rice gets cooked perfectly and the amount of the leaves. For getting perfectly cooked rice, soak the rice for 20 minutes, rinse gently with the running water. Bring water to boil. Add the rice, cook it in high flame for 7 minutes or until the grains doubled its size and with 15% of water remaining. Now close the lid and cook it on simmer flame for 10-12 minutes. I like the grains to be firmer. If you wish to have softer rice grains, allow it 2 minutes more in the low flame. 1. Heat butter and cooking oil in the pan, when butter melts add cinnamon, cloves cardamom, When it turns golden brown, add chopped onion and continue to saute till it turns soft. Then add ginger garlic paste, saute for a minute. Add chopped tomatoes and stir until the tomatoes are mushy. 2. Discard the stems and wash and clean methi leaves. Soak Basmati rice for 20 minutes and rinse it the water gently, strain and keep aside. Chopping the methi leaves is not necessary, as the leaves itself are very small in size. 3. Add methi leaves and continue to cook until the methi leaves slightly blends with the mixture. Add chili powder, Coriander Powder, Garam masala for a minute. 4. Add curd and saute gently, take care of the methi leaves(It should not turn mushy). 5. Add 2 cups of water, salt, and lemon juice, bring it to a boil. Adjust the salt and the sourness here. Add the kept aside rice and allow it to cook on the higher flame until the grains doubled its size and with 15% of remaining water. Close the lid and turn the flame to simmer. Continue to cook for 12-15 minutes. 6. Remove it from the fire and enjoy Methi Biryani with Cucumber Raitha. Methi Biryani yields a spicy, flavorful, nutrient-rich Biryani. Very easier to make and explained in step by step pictures and detailed instructions.
. Heat butter and cooking oil in the pan, when butter melts add cinnamon, cloves cardamom, When it turns golden brown, add chopped onion and continue to saute till it turns soft. Then add ginger garlic paste, saute for a minute. Add chopped tomatoes and stir until the tomatoes are mushy. Discard the stems and wash and clean methi leaves. Soak Basmati rice for 20 minutes and rinse it the water gently, strain and keep aside. Chopping the methi leaves is not necessary, as the leaves itself are very small in size. Add methi leaves and continue to cook until the methi leaves slightly blends with the mixture. Add chili powder, Coriander Powder, Garam masala for a minute. Add curd and saute gently, take care of the methi leaves(It should not turn mushy). Add 2 cups of water, salt, and lemon juice, bring it to a boil. Adjust the salt and the sourness here. Add the kept aside rice and allow it to cook on the higher flame until the grains doubled its size and with 15% of remaining water. Close the lid and turn the flame to simmer. Continue to cook for 12-15 minutes. Remove it from the fire and enjoy Methi Biryani with Cucumber Raitha. Serve along with onion, cucumber raitha. Masala fried potatoes would suit best with this biryani. Strick to the quantity of methi leaves, as amount could lead to bitter taste. If you wish to add little more sourness to the dish, then add lemon juice. Do not forget to look into other easy recipes like Capsicum Rice. 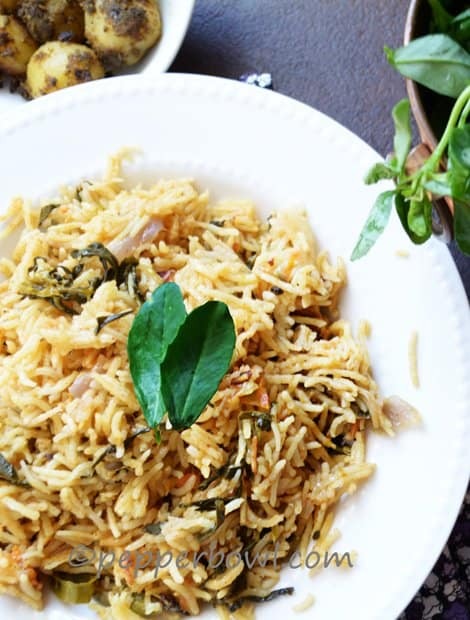 Briyani with methi leaves, something i would like to give a try definitely. I prefer methi over spinach anytime, looks delicious. That is great to hear. If methi leaves are not available, substitute with any vegetable like, cauliflower, peas, potato carrot. The other name for curd is yogurt. I guess yogurt may be available to you. Curd/yogurt acts as a tenderizer, and makes the basmati rice softer. You may also you coconut milk to substitute curd. Hope these helps.